This week's FSF is by Nick from French Toast Sunday! Check out his other guest posts here. I love music. Probably even more than film. So when the two come together in musical or “rockumentary” form, I’m there. Well, most of the time I’m there. I didn’t see Rock of Ages or Mamma Mia. I consider jukebox musicals lazy and the only good song Abba ever put out is ‘Fernando’ and I challenge anyone who says otherwise. But we’re not here to talk about that or comment on run-on sentences. I wanted to break historic ground in the Favorite Scene Friday frontier and present the first ever favorite scene from a documentary. The film is 2008’s It Might Get Loud and the scene I’m presenting may be the greatest introduction to a documentary ever. 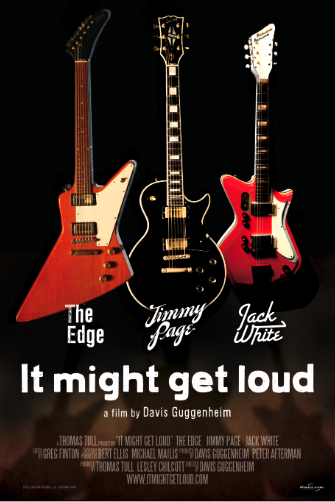 It Might Get Loud is a documentary/workshop where Jimmy Page (Led Zeppelin), The Edge (U2), and Jack White (The White Stripes) got together and discussed everything music and guitar. The three get together to share their stories and influences, as well as demonstrate some of the secrets behind their craft. But before we even get to that, we start on a farm in Tennessee. It’s maybe mid-morning, cloudy, and amongst grazing cows and random odds and ends, we see a silent Jack White hammering a nail into wood. He stands on the ground, using an old porch as his worktable. The concrete is weathered and the posts supporting the weight of the awning are old and paint chipped. He’s wearing the makings of a three piece suit. Black trousers, black shirt, and a charcoal suit with matching bowtie. A trilby hat sits atop his head as he hammers another nail into the wood. You can’t see his shoes, but you assume they were once shiny, now matted with dust from the farm. Cows look on as he ties a string between the two nails. Jack slides a glass bottle between the string and the wood and begins to hammer more wood. Still in a focused silence, he adds some basic guitar components to the wood, assumedly from a guitar he no longer uses. He plugs the creation into an amp, feedback garnering the attention from the cows. With one hand, he picks at one end of the crude instrument while the other works a slide up and down the string. 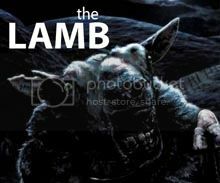 He brings his creation to life as it cries it’s bluesy tears through a heavy distortion pedal. After a few seconds, he clicks the pedal, silencing the cries. Jack makes a cigarette appear from thin air as he remarks, “Who says you need to buy a guitar?” The epitome of cool. Smash cut to a real guitar chorting out a bluesy riff as the opening credits montage begins. What follows is nearly one hundred minutes of being a fly on the wall in what is one of the coolest and most inspiring hang sessions ever. In this scene alone, yeah, Jack White is building a guitar, but really he’s showing you and telling you that you can do anything. You can create any thing, you can be any thing, and the craziest part: You don’t even need the basic tools. Make them all by yourself. Create them yourself. Go forth unto this world and pursue your dreams, passions, and inspirations. I can’t tell you how many times I’ve watched this scene and just drank in the creative passion behind it. I’ve never watched this and not smiled when it ended. It’s awe-inspiring and just plain cool. Whether you like the artists and the bands they are in, or not, the collective history and innovation between these three artists is undeniable and being able to learn from them is well worth the price of the film. What's your favorite music doc?